I don't know if and how it's possible to get a sample plate in Italy, but for sure there are some of them around because it's always essential to make some tests before starting mass-producing and it's likely that these samples are then given as a gift to some managers. 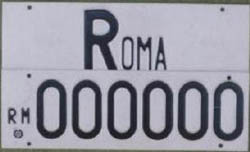 Since it's illegal to keep Italian license plates, it would be nice if it was possible to have samples. Anyway I'm still trying to find more about this subject and I hope to update this page soon. 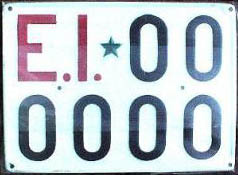 You can see below three pictures of Italian sample plates of the kind issued between 1985 and 1994 (see the history of plates for cars). You can see the letters "PGS A1" (Provveditoriato Generale dello Stato) on some of them and this confirms that they are original. 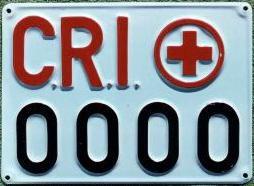 The fourth plate is a sample of the Italian Red Cross of the kind used until 1982(?) and the last is a sample plate of the Esercito Italiano used between 1968 and 1979. The fifth picture is taken from the web site of FrancoPlaque, while I must thank Giancarlo Raposo very much for the first four interesting pictures that convinced me to create this web page! I need to thank Antonio Carretta for the picture of this sample plate. Though sample plates of the Order of Malta don't exist officially, in the picture on the right you can see one of them. 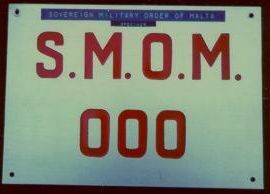 I'm very sure about its authenticity and the proof is a piece of paper of the Sovereign Military Order of Malta that was with the plate: click here to see it! I want to thank Jim Fox so much for this wonderful picture he sent me.